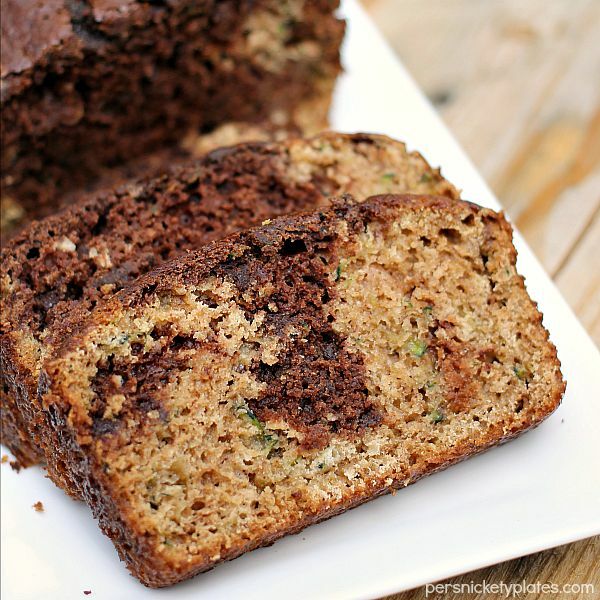 Classic zucchini bread gets an upgrade when you swirl in chocolate and chocolate chips! Is your garden done producing vegetables for the year? I feel like mine just started but I’ve heard a lot of people say theirs is done. I have a ton of tomatoes but I’m waiting on them to turn red – they’re all still green. I had six that were red that mysteriously disappeared a couple weeks ago. We have both a groundhog and a (super aggressive) chipmunk that run around the deck so I would guess one of them got to them. I grew and ate my first squash this year so I was pretty excited about that. I was especially excited that no one/nothing stole it. 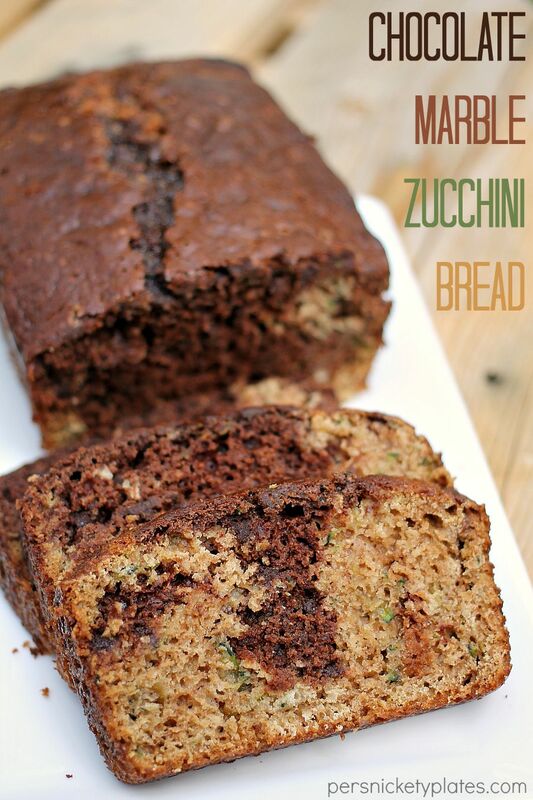 I didn’t plant any zucchini but my dad brought me some from his garden and I knew I wanted to make zucchini bread. I’ve done zucchini bread several ways over the years but I thought a swirl of chocolate with mini chocolate chips would be a good idea. I like to add chocolate to just about any dessert. It was an excellent idea because this bread turned out really good. I added applesauce to convince myself that since it has both zucchini and applesauce in it, it’s totally healthy (fruit and veggies AND chocolate!). I have a way of talking myself into things. 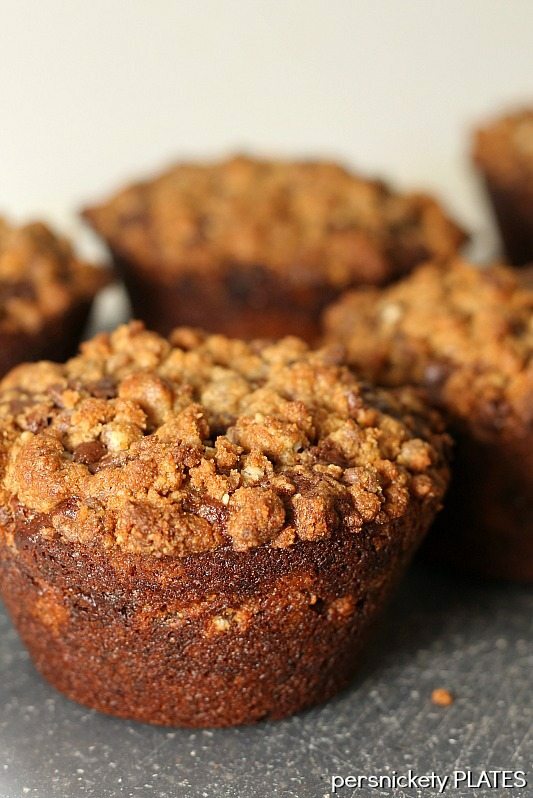 It’s really moist and I liked it best after a few seconds in the microwave to warm it up. My daughter helped me eat a bit of it but if we’re being honest, I ate the majority of the loaf by myself. 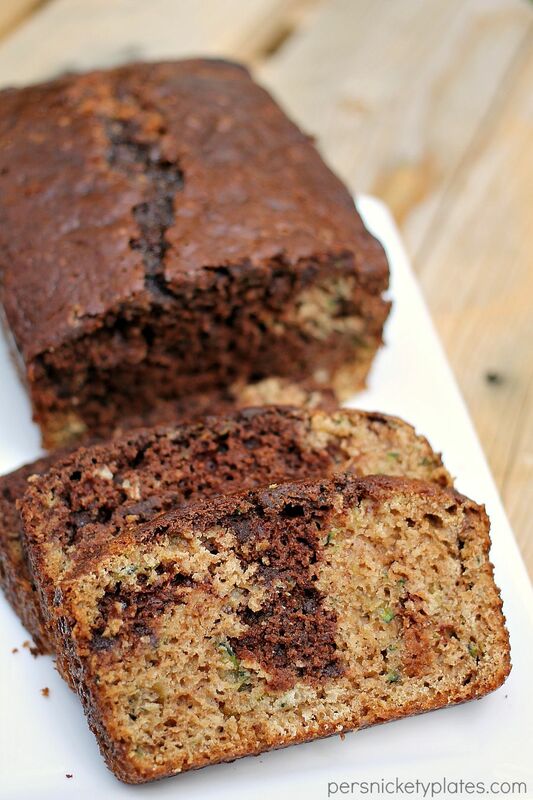 Classic zucchini bread gets an upgrade with a swirl of chocolate and chocolate chips. Grease a 9 x 5 loaf pan and set aside. In a large bowl, mix together the applesauce and sugar. Add in the shredded zucchini, water, and vanilla. Stir together. Add in the flour, baking powder and soda, salt, cinnamon, and nutmeg. Blend together. Pour half of the batter into your prepared loaf pan. To the remaining batter, add in the cocoa powder and chocolate chips and stir to fully incorporate. Pour the chocolate batter on top of the plain batter. Insert a butter knife and gently swirl to make a marbled pattern. 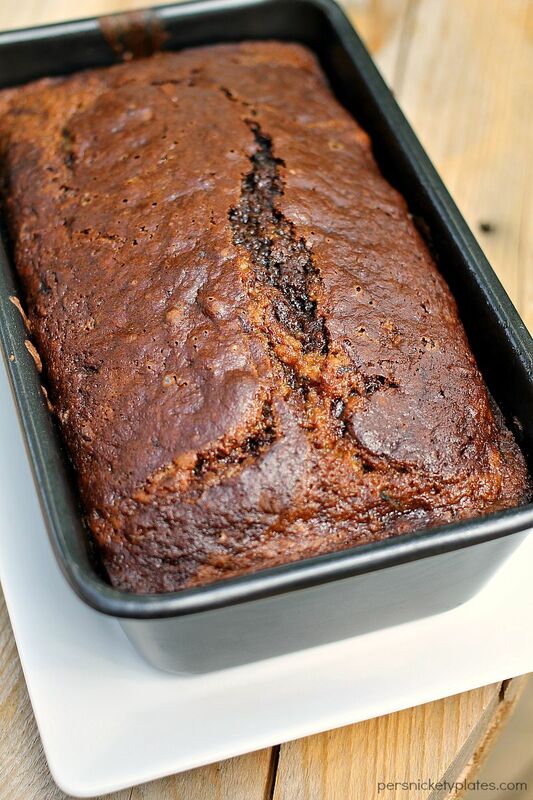 Don't overmix or you'll end up with all chocolate bread. 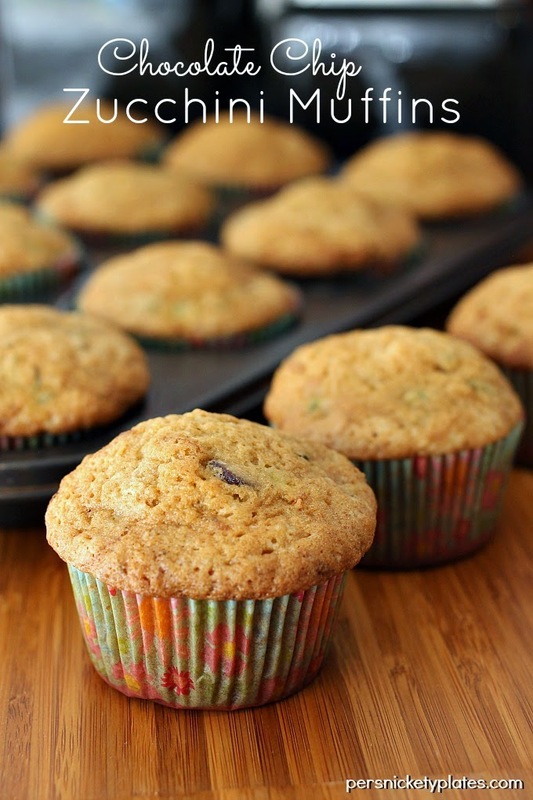 Need more ideas to use up your zucchini crop? Yum! This looks delicious. 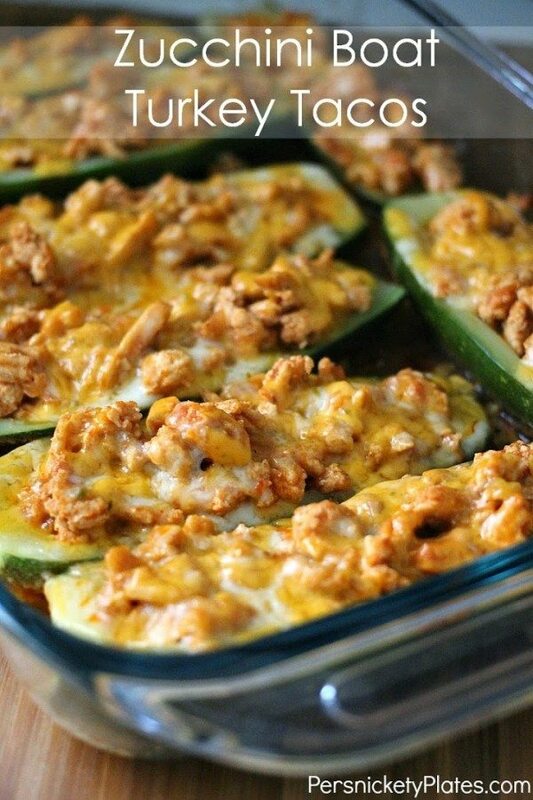 Our zucchini are done, but I may have to run to the store to get some for this!